The University of Utah Press Releases Spring Catalog | MARK JAY BREWIN, JR. 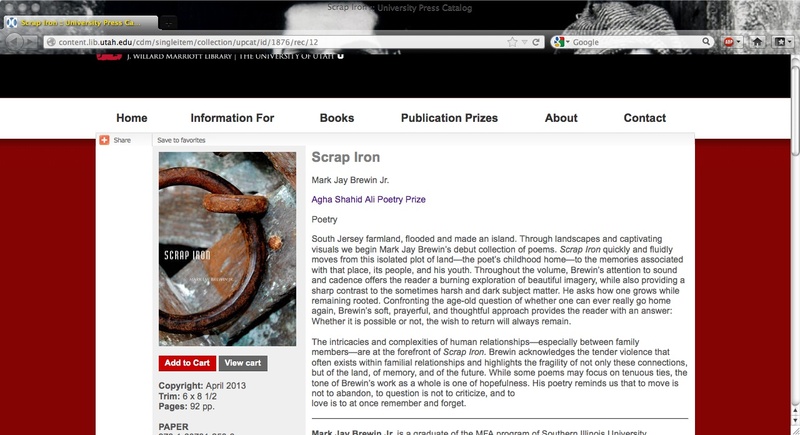 The University of Utah Press released their 2013 Spring Catalog the other day, and among their fine contributions to the literary world (and the academic community at large) was my own collection Scrap Iron, winner of the 2012 Agha Shahid Ali Poetry Prize. The book will be released April 15th. Take at look at the University of Utah Press’s website for all the details about the book, or click the “Book” tab above.